And the heavenly messenger said, Oh, there are eternal things that you have inklings about. and dreams fly through your eyes, and you soar, and your spirit for a moment is freed from the earthy chains of flesh, And you glimpse how it could be, that wonderful, immortal feeling of lightness, being that celestial body that you are called to be. You feel it at times in your dreams and daydreams of how it would be to not be human, to not be restrained to the earth, to seep up as a warm vapor into the light air, lifting off and wheeling this way and that, and breathing a life that is the essence and fount of all life, breathing into eternal lungs that which breeds immortal thought. Oh, you have had glimpses. You have heard whispers from those who guard you in the night, from those who breathe into your ear the precious seeds of immortality. But then you awake to the bands of a fleshly prison And soon hunger for things to stuff your face and things to place your instrument of eternal seed-bearing into. You awake from your fine dream that we’ve given you and then return to grovel in the lie that you are only animal. As in a search for anything, certain steps must be taken in order to find what one is looking for. before he finds the light of the eternal city. So it is with all of God’s sons and daughters. We are walking through “the valley of the shadow of death.” We must find the truth before we die. The fleshly limitations of our earthly bodies are winding down, tick-tock like a clock. Our time is running out here on earth. 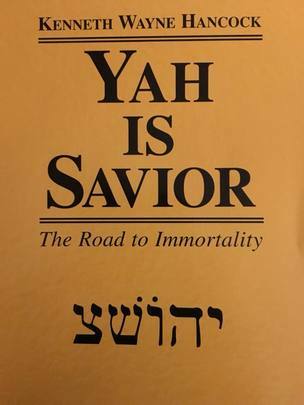 ​To send for this free book, All you need to do is to include your complete mailing address, Along with the words “YAH IS SAVIOR Book” in the subject line below.